There are certain challenges inherent in growing natural grass in large stadium environments. Stadiums cast shadows that limit sunlight. Edges of the field are difficult to maintain because of high volumes of traffic. Field maintenance crews have to balance providing the right amount of water without flooding portions of the field. So some coaches saw a perfect looking synthetic field as exciting to fans and a great recruiting tool as it always looked ready for game day. 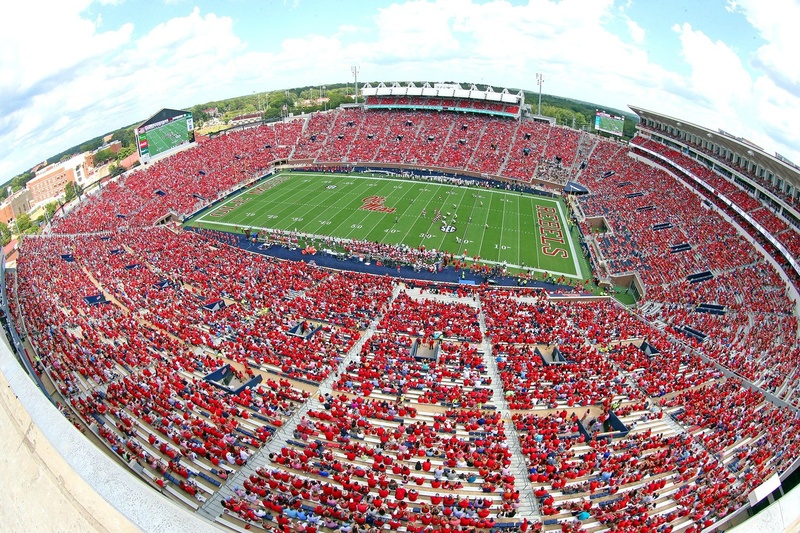 In 2003, the University of Mississippi installed synthetic turf at Vaught Hemingway Stadium. The university embarked on a process with some big decisions to be made. While natural grass was the preferred playing surface, it was decided to install a short pile synthetic surface in high traffic areas around the perimeter of the field, creating the ideal balance between synthetic where it was needed and natural grass where it counts most—where the game is played. A competitive bid process emphasized qualified sports field contractors with proven experience in projects of the size and scope of Vaught Hemmingway’s Stadium. Sports Turf Company Inc. was found to be the most qualified, with four certified field builders on staff and an extensive background in natural and synthetic field construction. With a big project comes big challenges. Access to the stadium was limited to a very small entrance requiring low body single axle dump trucks to import and export all of the material at a painstakingly slow pace. The schedule did not leave much room for problems encountered or weather delays. If a day was missed, other efficiencies had to be recognized elsewhere in the schedule to make up for it. By July the field had to be completely reclamated to allow the new sod time to become established before the first game. The coordination of vertical stadium construction along with field renovation meant working closely with numerous other contractors and scheduling had to contemplate all activities. Silt washing down onto the field construction site from other contractors onsite further complicated construction activities. Sports Turf Company, Inc. self performed 80% of the work with its own personnel giving them control to overcome all the challenges and deliver the field on time. Sports Turf Company, Inc. installed a complete natural grass field underdrain system including a 10-inch sand rootzone layer, 4 inches of gravel, and the drainage pipe itself. The irrigation system for the stadium consists of a new booster pump and Hunter STK-6V’s with eight retractable heads spread around the perimeter of the football field. The sprinklers make maintenance simple while keeping the surface intact, playable and safe. Each head produces 326.8 GPM and distributes water to a range of 165 feet, making eight of them the max that was needed to cover the entire football field. Certified Tifway 419 bermudagrass was installed inside Vaught Hemingway Stadium and on practice field number two to form a dense and durable surface. Tifway 419 has become the gold standard for warm-season athletic fields and is extremely popular in the realm of football fields. Tifway 419 bermuda’s ability to recover from damage rapidly and its ability to withstand the rough and tumble nature of football makes it one of the most durable hybrid bermudas. It is also drought tolerant and thrives in hot weather conditions making it the best choice for the University of Mississippi. A total of 188,325 sq. ft. or 20 loads of sod, were delivered for the stadium and the natural grass practice field. After it was installed it underwent a growing period, where it rooted and knitted together during a 3-week process. The success of this stadium can be attributed to the intelligent design and coordination of the many departments of the university. Short pile, high wear synthetic surface along the perimeter of the field will handle a lot of traffic from boom cameras, football players, referees and personnel. Overall this combination means the field will improve competition for players competing on a highly performing grass field while the perimeter of the field continues to look great. 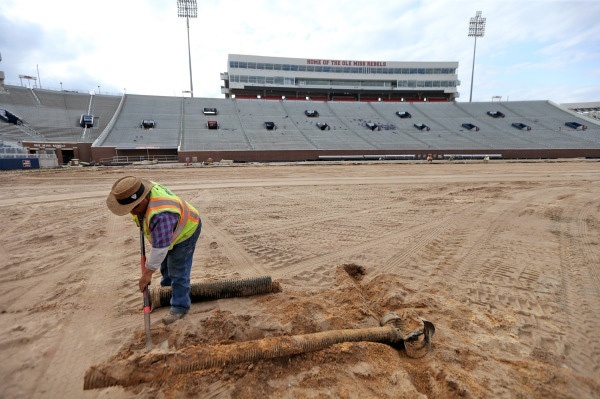 For the University of Mississippi, the conversion back to natural grass was a no brainer. It was the best decision for their athletes and their program. Grass provides a much cooler field temperature, often 35-40 degrees cooler than synthetic turf. Grass fields are safer with significantly more force reduction or lower Gmax rating than the previous synthetic field for softer landings. The field plays fast and firm while easily releasing cleats to reduce injuries. By blending both natural grass for the playing surface and synthetic turf for the highest traffic team areas, Ole Miss has the best of both worlds.